The world at your feet. This entry was posted in Life, society and tagged 2015, inspirational, Life, poetry, positive changes on December 31, 2014 by quiall. This entry was posted in Life, society and tagged attitude, daily quip, inspirational, Life, truth on December 30, 2014 by quiall. Change is a matter of perspective. This entry was posted in Life, society and tagged attitude, change, daily quip, inspirational, Life on December 29, 2014 by quiall. I am constantly amazed that people who profess to speak English manage to be understood at all. Seriously! We park in a driveway and drive on a parkway. Huh? English is my first (and only) language. I can say phrases in several other languages but that is simply amusing or impressive depending on how well you know me. It can be quite entertaining to listen to someone pronounce words simply by reading them. I’m not just talking about people new to the language. Some native speakers macerate words in the most interesting way. I once had to ask a friend to repeat several times the word she was saying before I could figure it out. We were talking about cartoons. She said she enjoyed…am-in-a-tion. I’m spelling it the way it sounded. She meant animation! Then of course you have different regions with different words for the same thing. Sneakers, running shoes and trainers all mean the same thing. A rug and a blanket mean the same thing but in different countries. English is a language that combines words from all over the globe. Bungalow has its origins in India. Denim – French. Night – German. Ostracize – Geek. Slogan – Celtic. 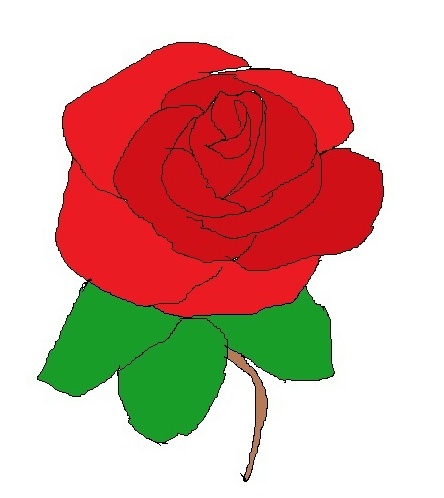 Ballot – Italian. Is it any wonder we can communicate at all? On the other hand some of our most memorable humour comes from our use, or misuse, of the English language. But you know what is most important in all of this? What is of paramount significance is that we try. We don’t always speak the same language but we have the same feelings. We love, we hate, we cry. We all have ambitions and we all have needs. This is a big beautiful world we all share and we do try to communicate with each other. There are people who are able to speak several different languages. Others try to learn about other cultures and ways of living. We just need to believe. We need to believe in ourselves. There is goodness in all of us as well as some not so good traits. But isn’t that what makes life a challenge? Let’s not give up on each other, please. 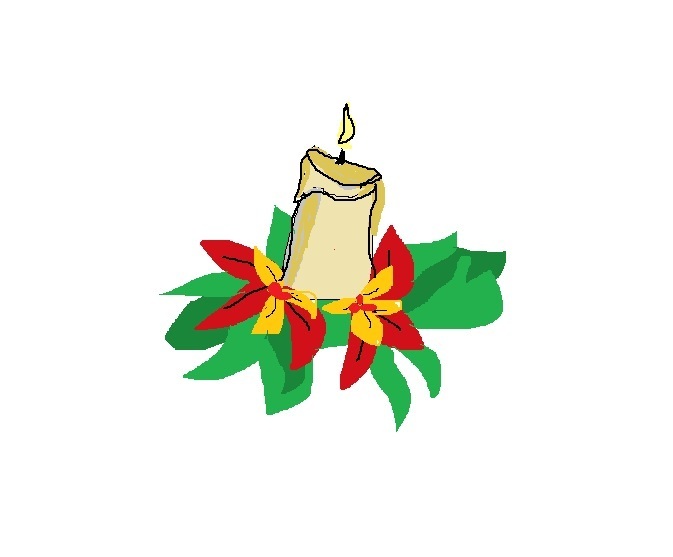 This entry was posted in Life, society and tagged attitude, believe, communication, humour, languages, OUR WORLD, perception on December 28, 2014 by quiall. I would like to introduce you to Itchy. 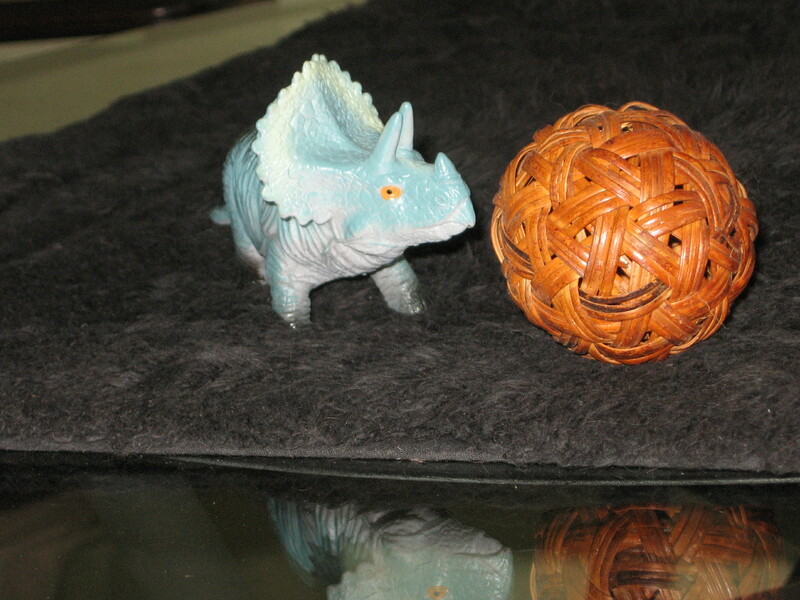 Itchy is a young triceratops. Once again the laws of physics do not apply. The young triceratops does exist and is the exact replica, albeit a much smaller one, of the fossils that have been found throughout the world. Like her ancestors this young creature is a plant eater or herbivore. Itchy likes to have a quiet, dark place to build a nest. She can quite often be found investigating her surroundings as she is a curious creature. Itchy was given the name she now has because of her penchant for scratching her body up against doorposts and furniture legs. It is almost as if she has an itch. Because she is such a curious creature Itchy will engage in gentle play. She seems to enjoy playing with a small ball. It has been noted that she may simply be repeating what is believed to have been the activities of her much larger relatives. When a triceratops was threatened by a larger enemy it would protect itself by running head first at the other beast and using its three bony horns to ram it. While this playful creature can be wondrous to watch, it is also important to note that the three protuberances can also connect with a handy ankle. It will hurt. But Itchy is a gentle creature, she would never intentionally do harm. This young dinosaur was found in a restaurant. It was actually discovered at the bottom of a large salad bowl that an elderly patron was in the process of eating. You can imagine the surprise on everyone’s face when 3 teeny tiny horns appeared underneath a leaf of lettuce and a plaintiff sound came out of this incredibly wondrous creature. Once the furor had died down, Miniature Animal Control (MAC) was called. This is not the first teeny tiny creature that they had encountered but it was perhaps the most affectionate. It is however difficult to become too cuddly with a dinosaur that has three hard horns, and a plate behind its head. The decision was made to find a permanent home for this wondrous creature from the past. Hopefully that home is with you. This entry was posted in Childhood innocence, Life, society and tagged children's story, dinosaur, inspirational, triceratops, whimsy on December 27, 2014 by quiall. 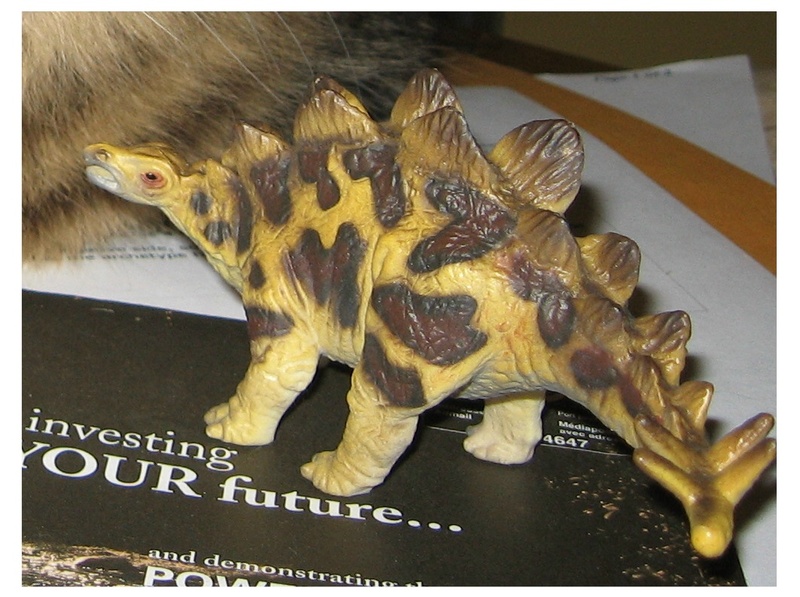 This young creature you see before you is a stegosaurus. Of course it is a miniature stegosaurus as the dinosaurs that lived during the late Jurassic Period, about 156 to 140 million years ago, were significantly larger. The full grown adult stegosaurus was up to 26 to 30 feet long, about 9 feet tall, and weighed about 6,800 pounds. The miniature stegosaurus weighs merely ounces, is five inches long and 3 ½ inches tall. And her name is Stella. Stella was discovered by a group of archaeologists working at a local dig. In actual fact it was a clutch of eggs that was found. As the eggs were intact they were given to a local scientist. In turn he decided to see if they could be hatched. There were seven eggs but only one hatched. That one was Stella. At first the scientist was amazed and then intrigued by what he had discovered. So the scientist did what scientists usually do: he studied the tiny creature. He took measurements, he took samples, and he wrote papers on the wondrous creature that was in his laboratory. All of the tests were done very scientifically so there was very little personal contact. Stella did not have another of her kind to bond with. She did not have the affection of the scientist, only the interest. But there was another human Stella came into contact with: a cleaning lady. The woman who cleaned up after the scientist did not understand measurements and samples and scientific papers. She did understand that this tiny creature needed affection. So when the scientist was gone, Stella was allowed out of her cage. That was when Stella escaped. Stella may have been young, she may have been tiny, but she was not shy. She didn’t like the prodding from the scientist. She didn’t like the cooing from the cleaning lady. She did like the feeling of freedom when she was let out of her cage. So she left. In the beginning it was a little intimidating to be alone and on the street. But Stella found out that people throw away the most amazing things. They throw away sweet things and they throw away warm things and they throw away things that smell really, really bad. Eventually Stella learned what the best things were to eat, where the best places where to sleep, and how to stay out of the way of people’s very big feet. Stella was having fun but she was also very lonely. The other creatures Stella had run into either wanted to eat her or treated her as if she was a play toy. So Stella was alone. That is until she was found by M.A.C. (Miniature Animal Control). This entry was posted in Childhood innocence, Life, society and tagged adventure, children's story, creatures, stegosaurus, whimsy on December 26, 2014 by quiall. Today of all days . . .
time to say the words . . .
from Canada . . . 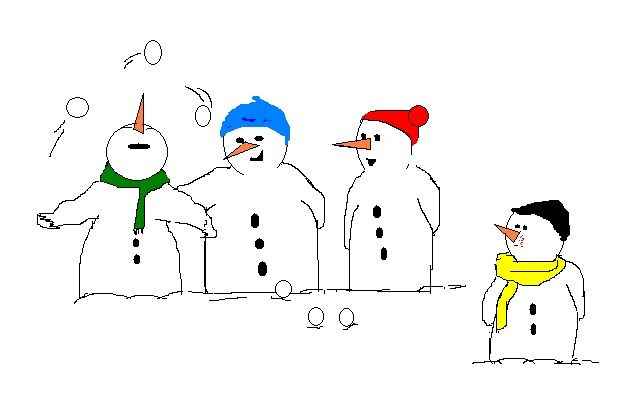 This entry was posted in Childhood innocence, Life, Multiple Sclerosis, society and tagged Canada, Happy Holidays, Merry Christmas, peace om earth, snowmen on December 25, 2014 by quiall. Horace liked his routine. It has been mentioned previously. As a matter of fact he liked his routine so much that when it was disrupted he was quite upset. Horace would wake up in the morning, he would shake his big head and stamp his big feet and give a great big yawn. Then he would check his dinner bowl from the previous night, just in case any little tidbits had miraculously appeared. The next item on Horace’s list was a quick jaunt to survey his domain. 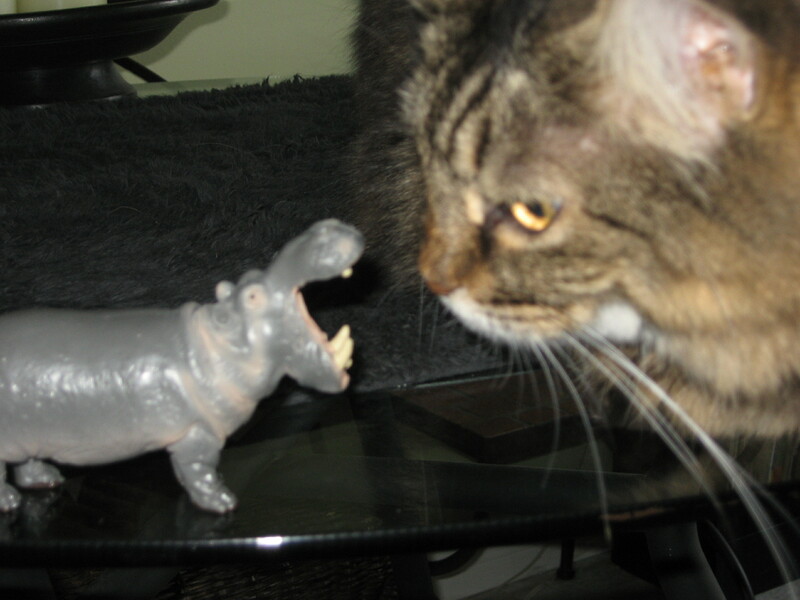 Being a very polite hippopotamus Horace was always sure to say hello to Ally the cat. Since the hu-man was usually still asleep Horace had free rein. So you can imagine how upsetting it was to find the hu-man wide awake and making a great deal of noise. The more he thought about it the more Horace was convinced that the hu-man had actually awoken him. 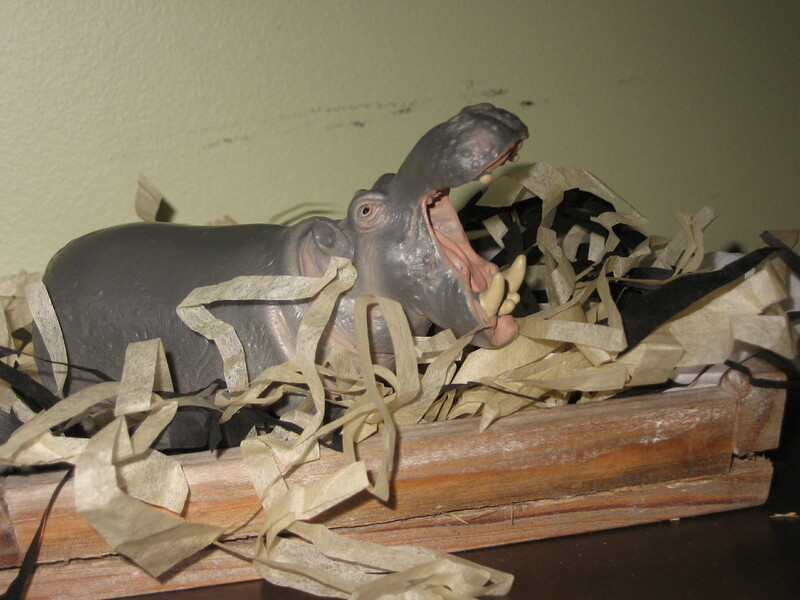 Now Horace was not the kind of hippo to complain for no reason. 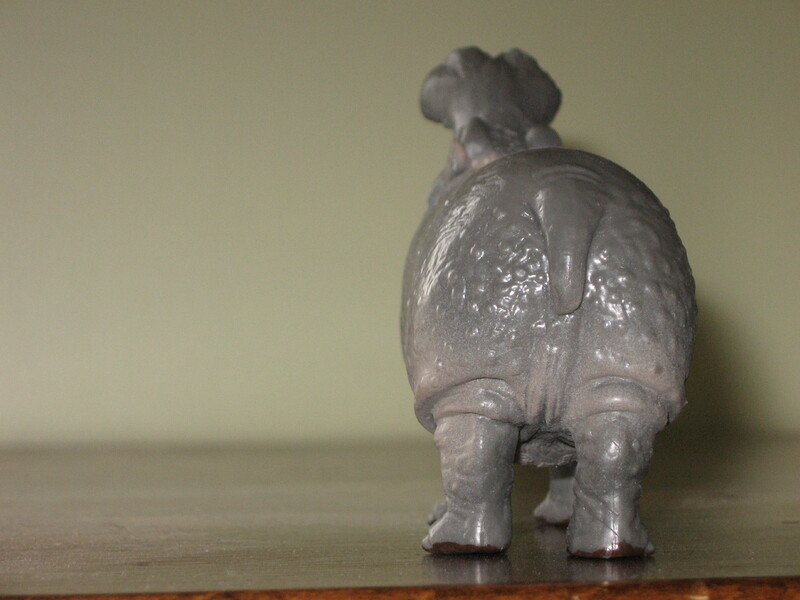 Rather he was the kind of hippo who went looking for explanations. And that is just what he did. One of the first things he noticed was a tantalizing smell or rather, several tantalizing smells. The second thing Horace noticed was that Ally was nowhere to be found. The third thing that Horace noticed was that he was hungry. All the things that Horace had noticed were important but the most important one was the grumbling that was coming from his tummy. So Horace decided to investigate. Like all great detectives he followed his nose. And his nose led him to a most interesting sight. One of the biggest differences between miniature hippopotamuses and the full grown ones is the ability to climb. Mini hippos have developed a technique that allows them to climb up onto furniture. Because there has been so little study on the abilities of these wondrous creatures there is no reasonable explanation for this talent. It is simply a fact. But it does explain how Horace was able to climb to the top of the dining room table. What he found there was indeed tantalizing. 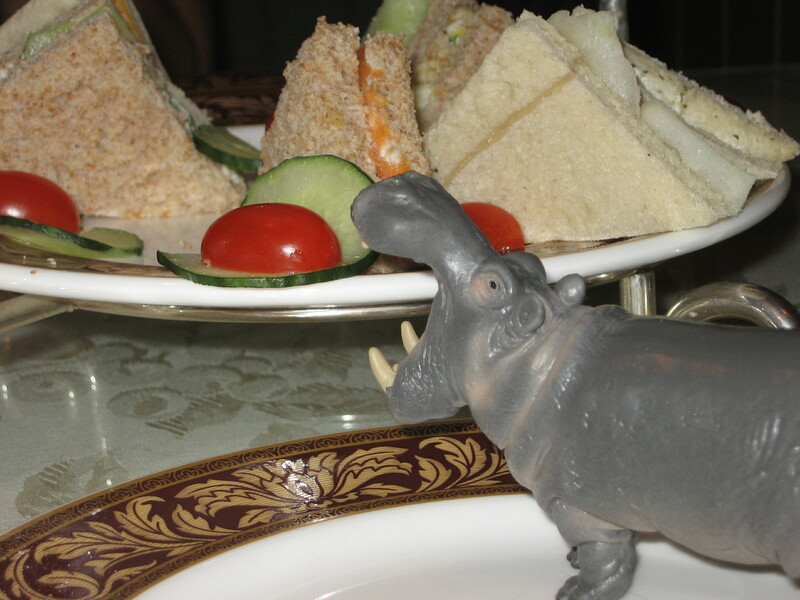 There were small sandwiches that were a perfect size for a hungry hippo. There were wonderful small tomatoes that while tasty, were also very messy. There were cookies and there were cakes. All in all Horace had a feast. He had so much to eat that he was afraid he wouldn’t be able to climb down. So he just laid down where he was, right in the middle of the cookie crumbs, the half eaten sandwiches and the leftover cake. Another habit that Horace had was falling asleep after a big meal and snoring. For the second time that day Horace was rudely awakened. This time it was by a screaming hu-woman. The poor hu-man’s company had arrived and no one had actually invited Horace to the luncheon. Now he understood why Ally was nowhere to be found. She was probably hiding somewhere close by and watching the spectacle. And Horace need not have worried about getting off the table, the hu-man saw to that. Well one good thing about all of this was that Horace wasn’t hungry anymore. After this adventure Horace needs a bath! This entry was posted in Childhood innocence, Life, society and tagged adventure, children's story, hippo, Horace, whimsy on December 24, 2014 by quiall. Horace had a routine. He liked to have a routine. He also liked his new friend Ally. She was the household cat and she was quite gentle. She liked to play, but she was very careful not to use her claws on Horace. It was nice to have a home and it was nice to have a friend. Horace explored almost everyday. He had only been here a few weeks and there was so much to explore. Horace had found out where Ally kept her food. He was very careful to only take the smallest amount, and only when he was very hungry. She also had a wonderful water bowl. It was so big it was almost like a pond. He only ever made the mistake of taking a swim in her water bowl once. Ally was a very gentle creature, but she didn’t like Horace in her water bowl. Fortunately he was a bright little hippo, he didn’t usually make the same mistake a second time. On one of this exploratory walks Horace made a discovery. This was a very nice home but it didn’t have any trees. It didn’t have any flowers, and it didn’t have any grassland. When he sat down and thought about it, Horace realized that there was no outdoors. 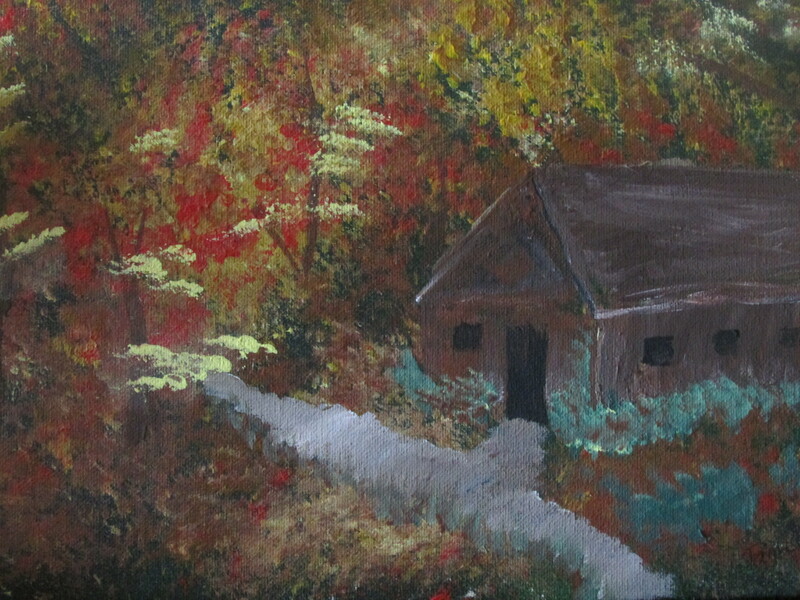 In his previous home there was a big outdoors with lots of trees and flowers and grass. It also had butterflies and grasshoppers and a big blue sky. Horace didn’t realize how much he would miss them until they were gone. Now Horace realized that he would have to go looking for the missing trees. It never dawned on him that anyone could live without the green stuff. And so it began. He started with the places he knew well. He looked in the mirror just in case something was hiding behind the glass. 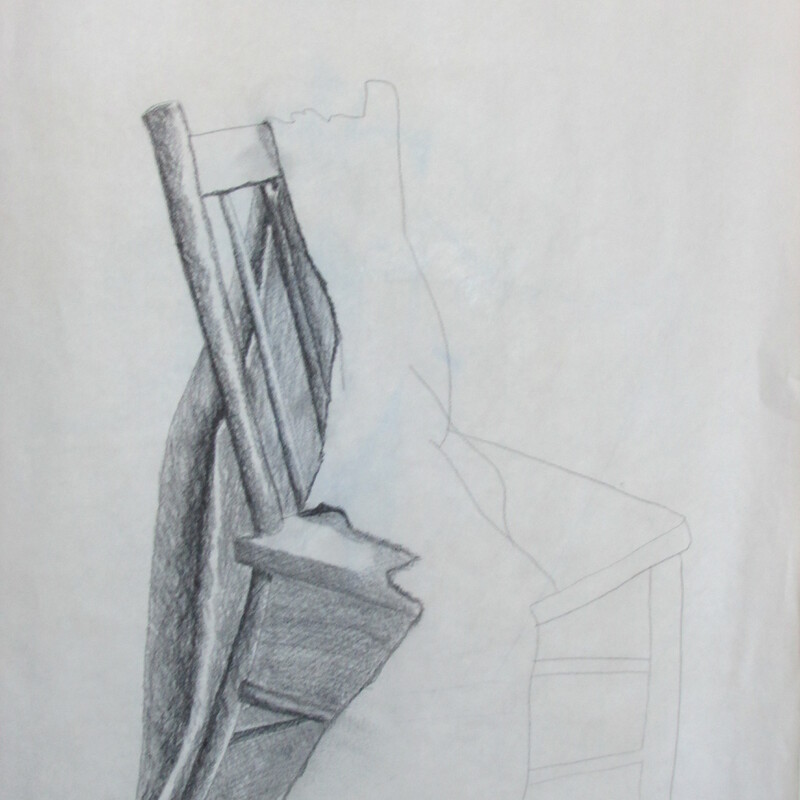 He looked underneath the couch; he had heard all kinds of things got lost behind cushions on couches. But there were no trees. Maybe he had it wrong, maybe there were no trees. Maybe Horace needed to look for shrubs. They were smaller, and easier to care for than trees. So that is what he did, he went looking for the missing shrubs. Horace thought he would ask his friend Ally to help but she was just about to settle down for her afternoon nap. As she was gently cleaning her whiskers she mused for a moment and then suggested that perhaps Horace was looking for the balcony. So he thanked her and went to search on his own. As Horace had spent most of his life in a house with a backyard he did not at first understand what a balcony was. But ever the optimist he was sure he would figure it out. And so with a smile on his face and a dance in his steps Horace went looking for the missing shrubs. For any of you who have gone on a quest to find something that was missing, you know how hard it is. You get thirsty so you have to stop and take a drink. You get hungry so you have to stop and get something to eat. And eventually you get very, very tired. Horace had spent all day looking for the elusive balcony and his missing shrubs. He was tired. And if you’re looking for something when you were tired you will probably miss it. So Horace decided to have a nap. He crawled into his nest and lay down gently on top of the straw. He was afraid if he snuggled into the straw he would sleep too long and miss the balcony. 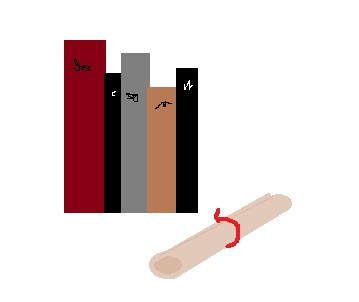 Horace inhaled the welcoming scent of the straw and gently drifted off to sleep. When we sleep our minds have the ability to unravel the mysteries we create during the day. And so it was for Horace. He dreamed of deep green lawns and tall trees. He dreamed of bushes and the sweet smell of rain soaked leaves. And most of all he dreamed of the blue sky. He knew it existed in his new home but he just couldn’t find it. Eventually Horace awoke. He felt refreshed. He felt a renewed sense of adventure. He would find this balcony, he knew it was close. And so with a shake of his tail Horace began again. He knew it wouldn’t make much sense to go to the places he had already been that day so he tried another idea. Horace had seen a door that he didn’t know where it went and today he was going to find out. When you are 2 in. tall it is a little difficult to open doors. It does help when the hu-man forgets to close the door all the way. Fortunately for Horace that is exactly what happened today. It wasn’t easy, there was a lot of grunting and groaning but Horace managed to open the door. What he saw next made his heart sing and his tail wag. It really was here. Right in front of Horace were his beloved bushes. The big blue sky was right where it was supposed to be, as if it had been waiting for him. There were stones to climb, flowers to nibble and leaves to rub along his back. Horace opened his mouth wide and started to sing. He knew he had more passion than talent but he loved every off key note. It had taken hard work and exhausting searches, but Horace had found his missing shrubs. Join Horace on his next adventure: HORACE HAS A LUNCHEON. This entry was posted in Childhood innocence, Life, society and tagged adventure, children's short story, hippo, Horace, smile on December 23, 2014 by quiall. Horace opened his eyes. Then he yawned, it was a very big yawn. With an even bigger sigh, Horace shook his tiny, little ears and stamped his great big feet and then he looked around. This gentle little creature looked around his new home. He knew it was his home because his bed was right here, his favourite toy was right here, and it just smelled right. But there was something that wasn’t quite right. Horace didn’t know what it was but he was going to find out. And he was going to find out right now. With a mighty heave Horace lifted himself up from his very comfortable bed and started out to explore his new surroundings. It had been a strange few days Horace thought. He had had a very nice home for many years with a very nice hu-man and then everything had changed. The hu-man had gone away and another one, a hu-woman had found him. That hadn’t been pleasant. Horace was just trying to say “hello” when the stranger had made a great many very loud noises that hurt his ears and then she had run away. She didn’t return but several other hu-mans did. They weren’t mean to Horace and they didn’t try to hurt him but the whole situation was very unsettling. If the truth were told Horace was quite scared. Now he was back with his own stuff in a new home. All the smells were the right smells but there was something very different going on here. So with a shake of his head and a swish of his tail Horace started out on his great adventure. 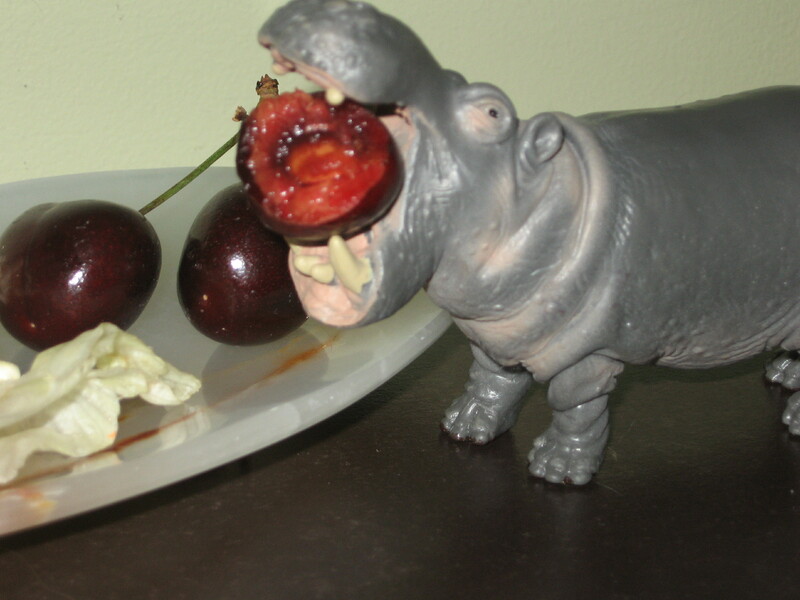 The very first thing Horace found was a cherry. Now it was a very nice cherry and it was sitting just where a cherry should be sitting if it was waiting for a rather hungry hippopotamus to find it. Horace had been raised properly. He had always been told never to be rude and he figured that it would have been rude if he had refused this very ripe gift so he ate it. Well the first part of the adventure had gone very well. Licking his rather large lips Horace continued on with his exploration. He could see several pieces of furniture but the light was quite low so he figured it was early morning. Maybe it was so early the hu-man that lived here was still asleep. Horace felt he had learned a great deal about hu-mans because he had lived with one for so long. He knew that they slept a lot, usually when it was dark but sometimes they put on artificial suns, lots of them, and stayed up after dark. It was quiet too. Hu-mans seemed to make noise all the time. It wasn’t usually as loud as the hu-woman had been but you can always tell when a hu-man is around. Horace continued on with his adventure. 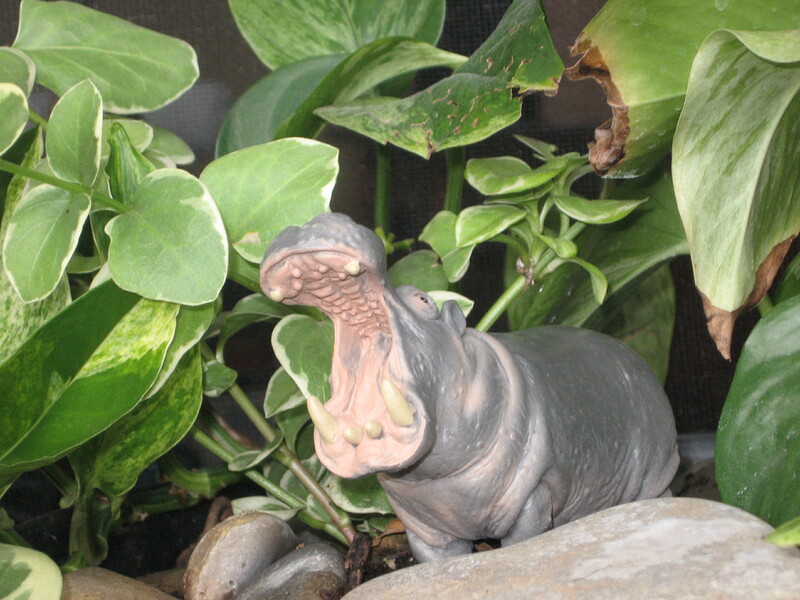 In one room he had a bit of a fright when he came upon another hippo that looked just like him! After a few minutes of watching the other hippo mirror everything he did, Horace finally figured that was just what it was: a mirror. He chuckled quietly to himself. “Nice looking hippo.” It was at this point that Horace became aware of an unusual noise. It was sort of like a prrrrrrrrrrrrr noise. Kind of soothing, it made Horace feel good to hear it but he didn’t know what made it. If Horace had looked up, he would have seen two golden eyes staring at him. Not too far from the golden eyes was a tail slowly twitching back-and-forth. The sound he had heard was coming from this creature. Very quietly a little meow was heard. Now Horace did look up. What he saw was a cat. Horace had never seen a cat before. When someone is faced with something that strikes terror into their heart one of two things can happen. First of all they can run. But if they run they will never know what they are running from. Second of all they can stand their ground and find out what is so scary. He was scared but Horace stood his ground. Now it is a fact that cats are not by nature evil creatures. Rather they are curious creatures. And that is exactly what this cat was. She was curious about Horace. Let’s look at this from her perspective: Ally, for that was the name of the cat, had never seen a hippo before. This strange little creature was walking around her house, looking in her mirror and generally breathing her air. Of course he didn’t look scary, he looked, well, curious. So she looked and she purred and she twitched her little tail. It was at that moment that Horace knew he had come home. This was not the old place, but it was his home. Join Horace on his next adventure: THE CASE OF THE MISSING SHRUB. This entry was posted in Childhood innocence, Life, society and tagged children, hippo, Horace, humour, short story on December 22, 2014 by quiall.